I always get compliments on my Quarter Zip Monogram Pullover and right now you can snag in 10 Colors for $23.99 (Retail $39.99). 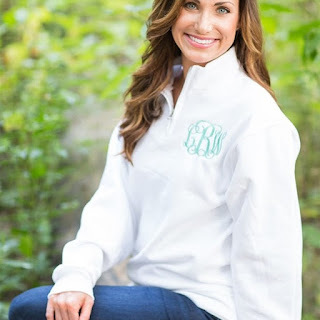 1/4 Zip MONOGRAM SWEATSHIRTS are the cutest! Customize with your favorite colors/school/team colors and your monogram! Great gift!